Broncholixir™ has been formulated to provide relief from the symptoms associated with inflammatory lung disease in horses. 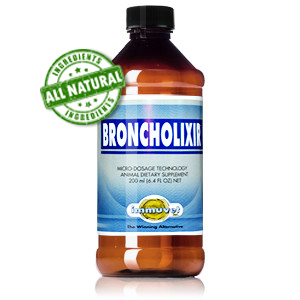 Broncholixir® contains a synergistic blend of compounds that provides a high level of bioavailability and bioactivity of its primary ingredients (present with the initial dose). It contains “no drugs”, being very beneficial when supplementing athletic horses that perform in a regulatory environment. Increase the rate of removal of mucus and relieves cough. Control and mitigate the symptoms associated with allergies. Strengthen the entire respiratory tract by decreasing the inflammation associated with the small airways. With rapid normalization of mucus secretion. Shake bottle vigorously 10 times before drawing 10ml dose (every time you use it). Give your horse 10ml of Broncholixir® on an empty stomach first thing in the morning for 20 days.